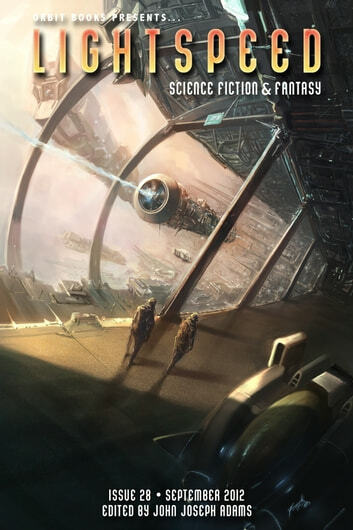 In our September 2012 issue, we have original science fiction by Adam-Troy Castro ("My Wife Hates Time Travel") and Brooke Bolander ("Sun Dogs"), along with SF reprints by Elizabeth Bear & Sarah Monette (""Boojum"") and Harry Harrison ("The Streets of Ashkelon"). Plus, we have original fantasy by Nina Kiriki Hoffman ("Monsters, Finders, Shifters") and Peter Sursi ("The Seven Samovars"), and fantasy reprints by Scott Edelman ("The Last Supper") and Holly Black ("Heartless"). For our nonfiction offerings, we have two artist showcases for you: one on our cover artist (Frank Hong) and another on our house illustrator (Galen Dara), along with a feature interview with bestselling author John Scalzi, and our usual assortment of author spotlights. 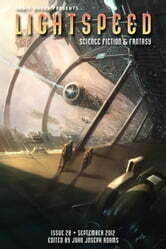 For our ebook readers, our ebook-exclusive novella is "The Green Leopard Plague" by Walter Jon Williams. And our excerpt this month is from The Eternal Flame by acclaimed author Greg Egan.